Law and Politics Book Review: IS THE AMERICAN CONSTITUTION OBSOLETE? by Thomas J. Main (ed.). Durham, NC: Carolina Academic Press, 2013, 304pp. ISBN: 978-1-59460-958-9. Paper $38.00. Reviewed by Michael A. Dichio, Department of Government, Cornell University. Email: mad286 [at] cornell.edu. Thomas J. Main’s edited volume, IS THE AMERICAN CONSTITUTION OBSOLETE?, asks an important question, a question that orients us politically to the founding document. The book’s actual question, addressed by some of the most prominent contemporary constitutional thinkers is, are parts of the Constitution antidemocratic by our contemporary understanding of “democracy?” Any student of democratic politics understands the importance of this question. Nevertheless, we know little about the connection between America’s constitutional design and its prevalent political problems. As the contributors take on this question, they provide nuanced interpretations of the Constitution and the causes of contemporary political woes. While none of the contributors call for the Constitution, as William Lloyd Garrison did, to be “immediately annulled” (p.11), the volume does encourage us to view the Constitution with less reverence and, instead, with more reason ‒ a practical guide for democratic governance. Because of the focus between constitutional design and political problems, historical institutionalists will find much in this book. The chapters are thematic across a number of constitutional topics, pairing one author who views the Constitution at the root of problems with another who sees it less to blame. A virtue of this structure is that we are able to see how parts of the Constitution bear on relevant policy areas. The chapters take up specific policy areas including slavery, the Electoral College, policy gridlock, judicial review, and the “imperial” presidency. Slavery is America’s most obvious compromise between democratic and antidemocratic forces and each subsequent topic confronts less obvious antidemocratic features exacerbated by the Constitution. Thus, at the heart of this book rests the idea that “we cannot decide what we think about the Constitution without deciding what we think about democracy” (p.12). Before discussing the substantive topics, the book begins with a broad discussion of the pros and cons of Constitutional revision. Daniel Lazare desires a Constitution that is more easily amended. He orients the reader to the undemocratic structural features of the Constitution, arguing, among other things, Article V’s amendment process is “not only undemocratic, but increasingly undemocratic” because of the growing population disparity among the states (p.16, emphasis in original). The structural obstacles to amendment are compounded by a culture in which the “cult of the Founding Fathers grows ever more ridiculous,” producing a “tendency to see the Constitution . . . as an object of religious devotion” (pp. 19-20). Lazare sounds a prophetic alarm: if constitutional problems remain unsolved, “some sort of rupture with the [*447] past is inevitable” (pp. 23). In contrast, Jeremy Rabkin values maintaining the enduring rights of the Constitution over the more easily amended Constitution Lazare desires. Rabkin argues that “calls for constitutional overhaul are profoundly misguided. All or almost all changes that have been proposed might be accomplished by procedures set out in the Constitution” (p.25). Rabkin worries that if “we reopen the questions now settled in the Constitution, a great many awkward new questions would arise” (p.30). Making the Constitution “easy to change,” then, Rabkin contends, would create a Constitution that “looks more like a legislative program” (p.32). While those frustrated with gridlock may thing they would like this, Rabkin warns that a Constitution comprised of “the view of contemporary majorities” makes the document simply about “current political winners try[ing] to impose their priorities on the losers” (p.32). Lazare’s and Rabkin’s juxtaposition highlight the primary division within the book: one side calls for drastic change (amendments, for example) to solve political problems while the other calls for incremental change ‒ changes in norms, procedures, and representation, for example. Thus, all contributors recognize significant problems plaguing the United States but disagree whether the Constitution exacerbates political ills or whether the Constitution can remedy those ills. With their discussions of slavery, Paul Finkelman and Mark Graber help us to see the Constitution for what it is: a pragmatic document fraught with tragic compromises. The slavery section best confronts whether the Constitution, resting on compromises over slavery made by the majority of delegates, is obsolete. Whether the Constitution is obsolete hinges on one’s account of the framing as Graber writes: did the Framers understand slavery as “a dying institution,” which remained secondary to “core constitutional principles,” or did sectional divisions inflect the entire constitutional design (p.69)? This distinction colors both slavery chapters; Finkelman sides with the latter while Graber endorses neither account, simply noting that one’s account of the framing shapes one’s ideas about constitutional obsolescence. That is, Graber believes “constitutional obsolescence is in the eye of the beholder” (p.83). Finkelman historically traces the myriad compromises made over slavery. He argues, “Because the Constitution created a government of limited powers, Congress lacked the power to interfere in the domestic institutions of the state . . . . The Constitution provided enormous protections for the peculiar institutions of the South at very little cost to that region” (p.48). The "dirty compromise" between New England delegates’ push for a broad commerce power and slavery implicated the north, which was “involved in the ‘carrying trade’ [and] would profit from transporting rice and other products produced by slave labor” (p.62). While Graber concurs that “the most important compromise over slavery . . . was the decision to yield temporary restrictions on federal power over the international slave trade for increased national authority over commerce” (p.76), Graber uses slavery “as a case study in constitutional obsolescence” (p.71) to argue that from the eye of the southern beholder the Constitution [*448] became obsolete by 1860: “Constitutional institutions failed to maintain the original framing commitment to the balance of sectional power” (p.79). If Finkelman illustrates the Founding compromises over slavery, then Graber demonstrates the crumbling of these compromises leading up to the Civil War. The book’s next sections, on the Electoral College and judicial review, examine prevalent democratic problems by offering nuanced interpretations of key parts of the Constitution. In the first such section, George C. Edwards III argues for direct election of the president while Larry A. Sabato maintains that, with changes, the Electoral College is better than direct election. Edwards believes the Electoral College curtails political equality because “it favors some citizens over others, depending solely upon the state in which they live” (p.88). It follows, then, that direct elections would strengthen the two-party system by providing “incentives for candidates to encourage all their supporters, no matter where they lived, to go to the polls” (p.97). Greater party competition, Edwards contends, protects America from the “mischief of third parties” (p.97). Ironically, Edwards argues for more inclusive presidential campaigns and seems to endorse further marginalizing third parties while also arguing for enhancing democracy. Like Edwards, Sabato recognizes the problems of the Electoral College, but his solution is a series of reforms. These reforms include, first, eliminating “faithless electors” (electors who cast votes that do not correspond with their state’s election results) (p.113). Second, eliminate the “unit rule” in the House of Representatives (the rule that gives each state, not each representative, a vote in determining the presidential election, should the election require the House to determine the president) (pp.113-114). And, finally, enlarge the electoral college by giving the ten largest states two more Senate seats and the next fifteen largest states one more Senate seat (pp.114-145). To get back to the volume’s central question, it is unclear if the elimination or revision of the Electoral College would advance democratic inclusion. Both Edwards and Sabato provide compelling interpretations of how the Electoral College affects voting. So, the reader is left with nuanced evaluations of this part of the Constitution, even if she is unsure of either author’s solutions. For example, while Edwards claims direct election would strengthen the two-party system, Sabato contends direct election would encourage a multiparty system (p.110). Judicial review is another part of the volume that provides nuanced analysis of a critical aspect of the Constitution. In this section, Mark Tushnet argues against judicial review, while Stephen Macedo defends the practice. Macedo provides a thorough explication of “democracy,” noting that at times undemocratic practices are “democracy-enhancing” (p.163). Macedo makes this claim because he moves beyond a majoritarian conception of “democracy.” Instead, democracy, “properly conceived” rests on three important features: equality, inclusiveness, and deliberation (pp.168-70). Noting that “its record is flawed but overall defensible,” Macedo offers a pragmatic justification [*449] of judicial review (p.177). But despite a section on judicial review in “practice” (pp.172-174), Macedo does not make clear how judicial review affects the equality, inclusiveness or the deliberation that he identifies as the three important democratic features. Tushnet also offers a fine-grained interpretation of judicial review. Much of his chapter undercuts three common “reasons offered in support of judicial review”: “justice-related,” “democracy-related,” “redundancy-related” (pp.155-160).He finds that a legislature is better equipped than courts to deal with the “complex task[s]” of resolving “contestable ideas about democracy” and justice (pp.157, 159). Even the possibility of unconstitutional statutes does not justify judicial review. While , proponents of judicial review treat “legislative errors as more serious than judicial ones because legislative errors lead to enforcement of unconstitutional statutes whereas judicial ones ‘merely’ deny the public of the benefit of constitutional ones,” this is mistaken . According to Tushnet, the “redundancy justification” treats legislative errors as more grievous than judicial errors because it erroneously endorses “an implicit libertarianism,” seeing “less legislation . . . better than more legislation” . This normative assumption at the heart of redundancy justification reduces redundancy to justice-related justifications, which, as noted, is fraught with its own conceptual problems (p.160). Tushnet does a wonderful job addressing potential criticisms, and an especially important one he addresses is whether judicial review is actually democratic: “Whether through express constitutional authorization or through embedded practice, judicial review appears to have precisely the democratic warrant that judicial review’s opponents seek” (p.161). Tushnet offers an interesting answer: “Perhaps popular ‘acceptance’ of judicial review is more a sign of resignation . . . that democratic majorities have been unable to eliminate a practice favored by political elites than of positive support for the practice” (p.161). This may be the case, but should it alarm us more than when elites maintain other forms of coercive powers? Indeed, elites facilitate, defend, and sustain innumerable governmental powers that majorities do not favor. The remaining four chapters offer two different interpretations on the alleged causes of policy gridlock and the imperial presidency, showing us how parts of the Constitution might bear on relevant policy problems in Congress and the presidency. In this regard, Sanford Levinson’s criticisms are the most outspoken. Levinson blames the Constitution for making “it considerably harder than it should be for our basic institutions to respond to the exigencies that face the American polity” (p.123). Levinson does not mince words, getting to the point in his first paragraph: “because of the near imperviousness to structural constitutional change created by Article V,” the United States Constitution has not created an “effective” government (p.121). The connection between gridlock and Article V, however, could be made stronger, especially how alteration of Article V could be a panacea to the “victims of gridlock” (p.124) . To be sure, Levinson offers solutions beyond reform of Article V (changes in Senate representation, for example, pp.130-132). But, the crux of [*450] his argument rests with Article V, and Levinson does not show how changes to Article V would solve potential gridlock problems. In conversation with Levinson, R. Shep Melnick contends critics overstate gridlock, providing a long list of recent legislation (pp.139-42). Levinson remains unconvinced: “It is simply not enough to present . . . lists of what the Congress has been able to pass, even during times of divided government” (p.124). Levinson criticizes Melnick for a “rather optimistic telling” of the story of American politics because his narrative “smuggled” in problematic normative assumptions into that story (pp.123-124). Of course, we build normative assumptions into all our arguments, and Levinson is no different: his is that the Constitution should enable citizens to remedy policy problems. And Melnick and Levinson disagree on this exact assumption. This fundamental disagreement is at least implicit when Melnick argues that “constitutional revision is unlikely to cure much of what ails us” and “if you really are serious about constructive change, talk to your Senator about restricting unilateral holds and about respecting PAYGO rules” (pp.147, 148). The chapters on policy gridlock rehash the typical sides of these constitutional debates ‒ Levinson wants drastic change and Melnick notes the merits of incremental change (p.145), citing Madison’s intention to create a government that is “commonly blamed for stalemate and gridlock” (p.136). Since Melnick provides solutions, albeit solutions of a smaller order than Levinson’s, he must believe political problems exist within American society. But if policy gridlock is “descriptively inaccurate” (p.148) then what problems do Melnick’s suggestions solve? Much like the chapters on policy gridlock, the imperial presidency’s precise connection to Constitutional design remains murky. Richard Pious takes a broad historical perspective to conclude that President George W. Bush (and to a lesser extent President Barack Obama) are “imperial” presidents while Presidents Abraham Lincoln and Franklin Roosevelt are not. Pious’s argument hinges on the differences in the “style of governance” between the non-imperialists (Lincoln and FDR) and the imperialist (Bush) when each claimed their “prerogatives” (p.197). While Lincon and FDR won congressional support, Bush created a system “in which the executive for an indefinite period of time was [able] to exercise quasi-legislative and quasi-judicial powers and bypass Congress and courts” (p.197). Yet on the same page Pious asserts, “When Congress did pass legislation dealing with the new procedures or courts Bush had created, they authorized much of what he had done, either explicitly or through legislative loopholes” (p.197). This is precisely what happened under Lincoln and FDR. Thus, for Pious, post-hoc Congressional and judicial approval is not sufficient to exonerate presidential actions; it is the way the president governs that makes him imperial, which might leave too much room for subjectivity. By contrast, Marc Landy argues that the other national branches should have exercised more empathy when making decisions pertaining to President George W. Bush’s War on Terror and War in [*451] Iraq (p.208). Landy’s chapter “defends the Constitutional fidelity of Bush’s conduct of the War on Terror and the War in Iraq but without accepting” the scope of the unitary theory of executive power. More than that, the Supreme Court’s eagerness to “substitute its judgment for that of the president regarding critical matters of War on Terror tactics,” Landy claims, demonstrates that the Court surpasses “the presidency with regard to the imperial threat it poses” (pp.207-208). For Landy, the “imperial threat” applies only to the process not to the substance of the Court’s decisions—the Court usurped presidential power in a war or terror (p. 229). But, with the “imperial presidency,” he recognizes the term has a “dual meaning:” “[The president] is imperial not only because he usurps power properly left to the other branches but because he is an imperialist, promoting the American empire” (p. 216). Landy, however, does not extend this same dual meaning when he dubs the Court imperialist. Indeed, substantively, the Court’s decision have bestowed rights on those subjected to American might. Despite holding different interpretations of President Bush, Pious and Landy reach the same prescriptive conclusion; Pious writes: “The Constitution does not need to amended . . . it needs to be preserved, protected and defended with the institutional powers currently possessed by Congress and the courts” (p.205). Landy’s indictment of the other national branches calls for more cooperation and deliberation, not for Constitutional amendments. 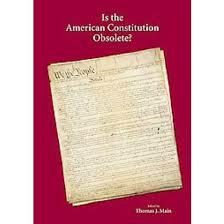 In the end, IS THE AMERICAN CONSTITUTION OBSOLETE? recognizes political problems facing the country. The contributors all agree that change, on some level ‒ whether it be incremental, drastic, institutional, or civil ‒ is necessary. Across the chapters, this change, either implicitly or explicitly, takes the form of calling for more democracy ‒ more inclusion and deliberation. The book’s didactic approach to constitutional criticism has the powerful effect of toppling some of our reverence for the Constitution thereby making room for substantive criticism. As such, the volume would be an appropriate text for upper-division seminars exploring the relationship between constitutionalism and political problems. Ultimately, these scholars write in the hopeful spirit of Frederick Douglass when he gave his July 5th, 1852 speech: “The Constitution is a glorious liberty document . . . . it will be found to contain principles and purposes, entirely hostile to the existence of slavery.” All the contributors focus on these “principles and purposes,” seeing, like Douglass did, the ways in which we are still striving toward the lofty goals set in motion in 1789. Copyright 2013 by the Author, Michael Dichio.